It's Friday, and this Sunday is the BIGGEST game of the NFL football season, the Super Bowl! And when I say Super Bowl I KNOW the first thing that comes to your mind is WINGS! Oh man, who doesn't love a good chicken wing? However, when you are planning a party, you don't want to be stuck over a fryer doing dozens of batches, while all of your friends and family are having a great time watching the game. 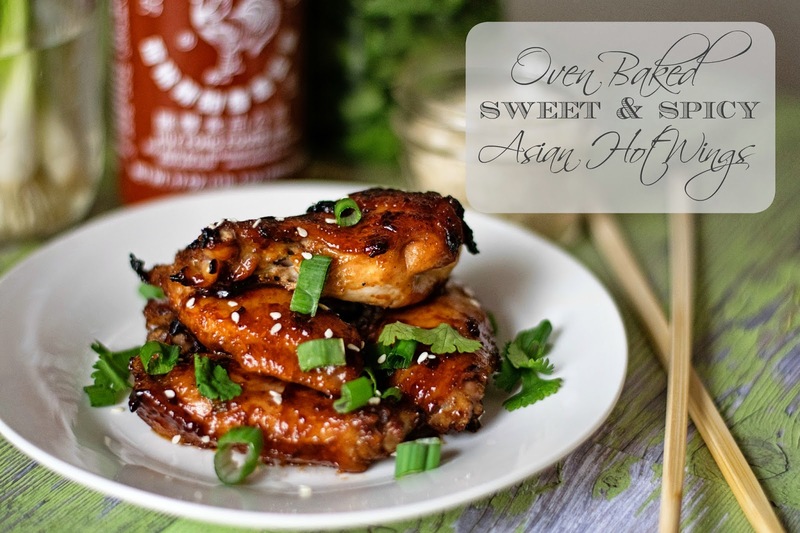 That is why I came up with these AMAZING, oven baked, Sweet and Spicy Asian Hot Wings! They are perfect and your crowd is going to go WILD for them! I can't wait to show you how I did it, so let's get started! Whisk everything together until smooth and taste for seasoning. Pepper you feel the marinade needs. Now you can add the THAWED chicken wings into a resealable bag. Pour the marinade over them, making sure to reserve some for basting while they bake. Close the bag and massage the wing until all of them are coated in the marinade. Place in the refrigerator for 1-3 hours. After you have allowed the wings to marinade for at least an hour, line a baking sheet with foil and lightly spray with cooking spray. Place the marinated wings in a single layer on the baking sheet. Place into a preheated 400 degree oven for 30 minutes, basting with the reserved marinade every 5-10 minutes. After baking for 30 minutes, place under the broiler for 2-3 minutes to crisp the skin and further caramelize the sauce. 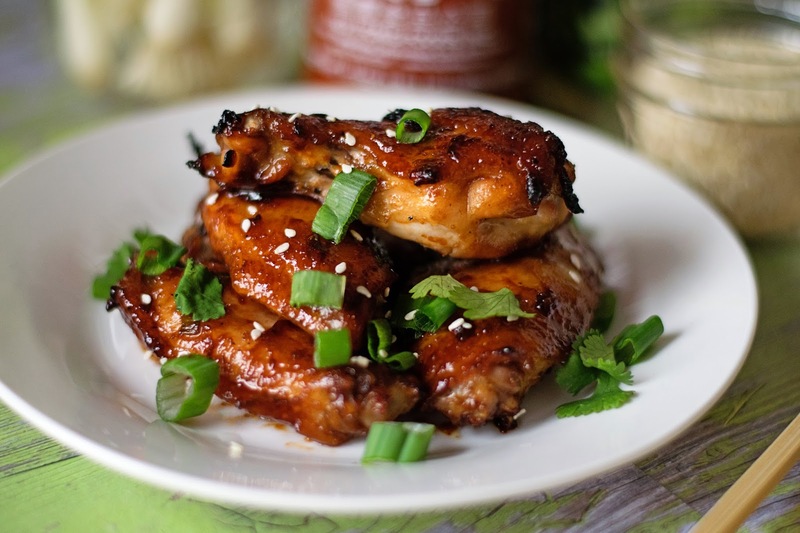 Once you place these Sweet and Spicy Asian Hot Wings on your serving tray, you can top them with some sesame seed, cilantro, and the greens of your scallions. 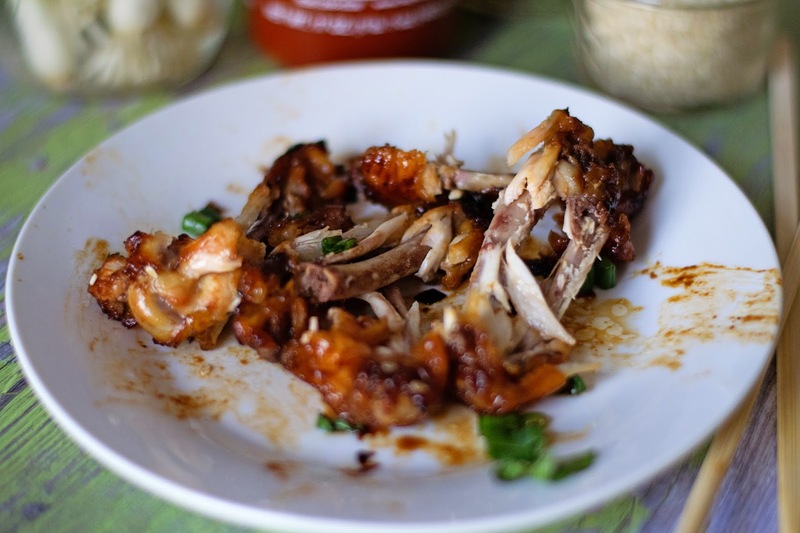 These wings are perfectly crisp, sweet, sticky, and spicy! EVERYTHING you want your game day hot wings to be! In fact, they are so good you are going to be saying to yourself "Buffalo Who?!?" And pretty! These wings are beautiful!! So beautiful in fact that, you better snap a quick pic and grab a few, because just like that...these wings will be GONE!!! So if you are looking for an alternative to the fried Buffalo wings this year, give my oven baked Sweet and Spicy Asian Hot Wings a try! You will be SO glad you did!! In a mixing bowl, combine the plumb fruit spread, soy sauce, hoisin sauce, honey, sriracha sauce, sesame oil, garlic powder, and the whites of the sliced scallions. Whisk until smooth. Taste for seasoning. Add any salt and pepper you feel it may need. Place the THAWED chicken wings into a resealable bag and pour the marinade over the chicken wings, making sure to reserve some for basting. Seal the bag and massage the sings until they are all coated with the marinade. When ready to cook. Preheat the oven to 400 degrees. Remove the marinated wings from the resealable bag, and place them on a foil lined baking sheet that has been lightly sprayed with cooking spray. Bake in the oven for 30 minutes, basting with the reserve marinates about every 5-10 minutes. After 30 minutes place under the broiler to crisp and char the skin, about 2-3 minutes. Top with a little sesame seed, cilantro, and the greens of your scallions.